Added new Add New and Edit dialog, with removed tabs and new date selection dialog. See screenshots section for new appearance. 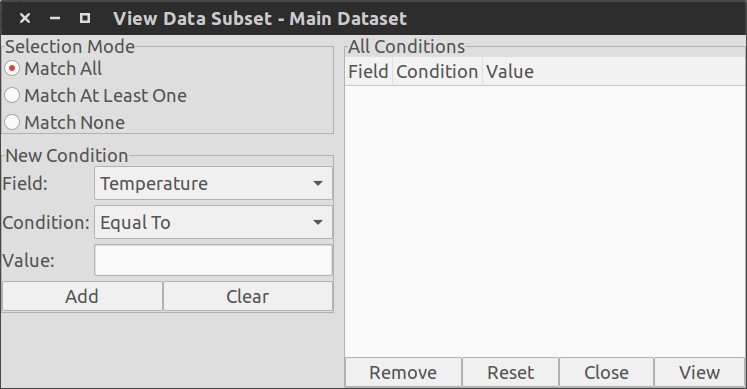 Added new Data Subset selection dialog. This new dialog has added usability as well, with new buttons to reset and clear fields. See screenshots section for new appearance. 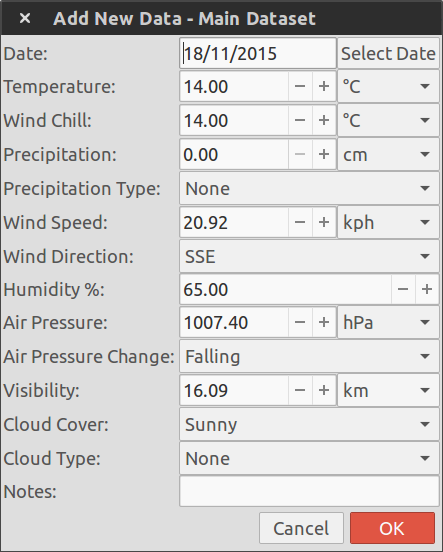 Air Pressure is now a field in Data Subsets. This should have already been there, I think this was more likely a bug from when the new fields were added. Not entirely certain though, I may have simply forgot about it. For conditions that accept multiple values, Data Subsets now splits these values on comma + whitespace instead of simply a comma. Added type error checking and error dialog for Data Subset. It is no longer possible to compare string values in numerical fields. Increased the width of the dataset selection dialog. Clearly this was the most important change of this release. CODE: Replaced all global variables with class variables. I’ve gone through everything multiple times, but due to the number of functions that rely on these there is very likely still something small that is broken from this change. Anything remaining will be fixed as soon as I find it. On the plus side, this helps modularize the application more, and even opens up the possibility of importing the main file and initializing the application from another (though why you’d want to I have no idea, but still, kind of cool). CODE: Moved main user interface creation code to a new function. CODE: Continued to remove the “profile” name and replace with “dataset”. Still not complete, mostly because this is used too much in too many places to rely on a simple replace, and I don’t really want to go through every file and change the name in comments and variables by hand. CODE: Removed unused “py_version” global variable. I believe this was something used in previous code that was version-specific, but this code is no longer present. CODE: Starting cleaning up imports. There were many unused or redundant imports. CODE: Icon path is now stored in launch.get_ui_info(), instead of being hard-coded. CODE: delete_event() now uses io module. CODE: data_dataset_new() and related functions now use io module. CODE: Added and implemented application constants, mostly for custom dialog return values. This should improve code clarity and cut down on the wrong return value being used. Fixed selection mode “None” not working properly. Fixed creating a new dataset then immediately closing the application without any further actions causing the application to load the previous dataset on next load. Fixed Import All button in Import, Import and Merge, and Import as New Profile not working if no data was selected.